Zarbon is Freeza's right-hand man and one of his more powerful henchmen. 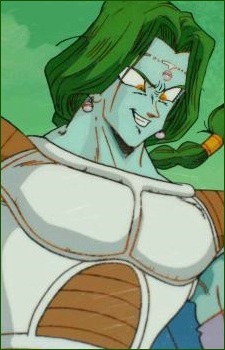 He has long, green braided hair and wears a tiara and earrings, giving him a more attractive look amongst Freeza's soldiers. Because of this, Zarbon thinks highly of himself and values things based on how attractive they are. Zarbon has the ability to transform himself into a reptilian humanoid, increasing his strength and ferocity while also detracting from his looks. Because of this, he avoids transforming whenever possible. Zarbon accompanies Freeza to Planet Namek where he fights and captures Vegeta. When Vegeta recovers and escapes, Zarbon is sent to retrieve him, though Vegeta's increase in strength overwhelms him. Zarbon tries to get Vegeta to join him to fight against Freeza, but Vegeta shows no interest, instead punching a hole straight through Zarbon's stomach, then a Ki blast which shoots straight through Zarbon flying and into the waters below.